Do you remember when an album cover alone could compel you to listen to just about anything? I was 5 yrs old, sitting mid the floor-sprawl of my dad’s records. A transparent ruby-red lp disc of Finlandia spun on the player. The sound enveloped me in waves and I was looking at the album cover – a painted forest that I walked into deeper and further beyond the shafts of sunlight until I completely disappeared. 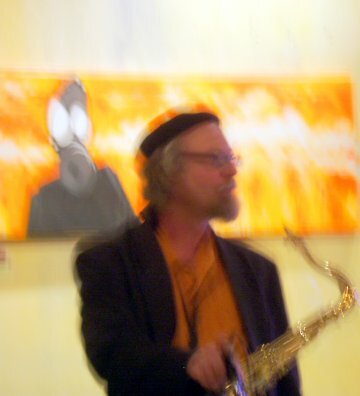 Some part of me never returned; that sector devoted to having a modicum of common-sense to get through life (sensibly), find my sax neckstrap, and remember to turn off the iron. Music has been the sustaining passion since childhood and there are players/composers in pockets of space and time I keep coming back to like healing fountains and reminders of what could be; Lester Young 1936-1945, Sonny Rollins 1956(phewww! ), Coltrane’s Crescent, Pharoah Sanders, Isaac Albeniz’ Iberia, Debussy, Bach’s Cello Suites, Puccini, Sam Cooke, Van Morrison’s Astral Weeks, Hamza El-Din, Fred Neil, Planxty, The Bothy Band, Martin Hayes, Love’s Forever Changes, Donovan, Joao Gilberto, Jolie Holland…. I love to learn and love to teach; particularly enjoy teaching improvisation to the newly curious of all ages. Wardell Gray – dedicated to another idol, the brilliant tenor saxophonist Wardell Gray. The sound clip with Count Basie says it all! Tom Killion– if you’ve ever been up the coast of California you’ll appreciate this artist. John Paul Caponigro– music for the eye! Jeremy Lipking – great painterly painter! Lord Buckley – site dedicated to one of the GONEST cats ever to grace this sweet swingin SPHERE!